I am a second-year PhD student at Berkeley and a member of Berkeley AI Research. I am advised by Alyosha Efros. I am broadly interested in computational models of perception, embodied cognition, and intelligence. Currently, I am interested in self-supervised learning, continual learning, and autonomous skill acquisition. Previously, I was a Research Engineer at Facebook AI Research. Before that, I studied Computer Science at Princeton (B.S., 2015). I am gratefully funded by the PD Soros Fellowship and BAIR. X Wang*, A Jabri*, A Efros. I was selected as a PD Soros Fellow for the class of 2018! I met so many inspiring and brilliant peers throughout the interview process and I am honored to have been selected. A Srinivas, A Jabri, P Abbeel, S Levine, C Finn. M Baroni, A Joulin, A Jabri, G Kruszewski, A Lazaridou, K Simonic, T Mikolov. A short paper on the nature of tasks we are studying in the CommAI project. A Li, A Jabri, A Joulin, L van der Maaten. In which we show a recursive smoothing loss allows us to learn visual representations grounded in compositional phrases, at scale. 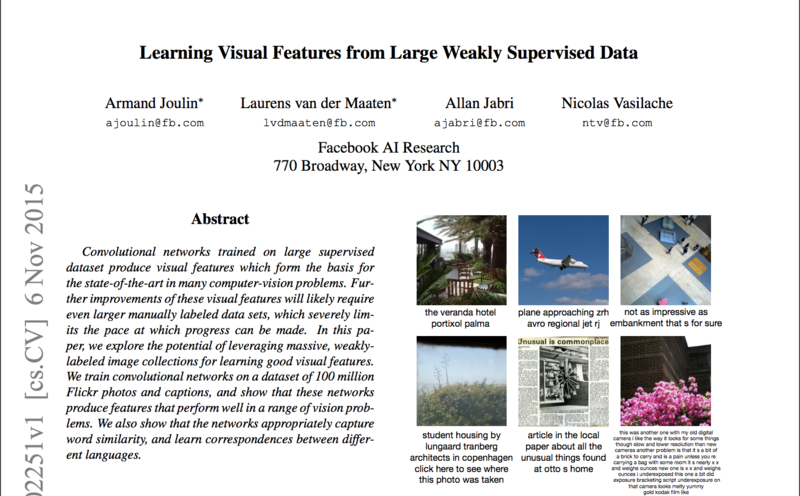 I co-organized the Machine Intelligence Workshop at NIPS 2016, where I also gave a talk about CommAI-env. Fellow organizers: M Baroni, A Joulin, T Mikolov, G Kruszewski, A Lazaridou, K Simonic. We open-sourced CommAI-env , a platform for developing AI systems as described in "A Roadmap towards Machine Intelligence". 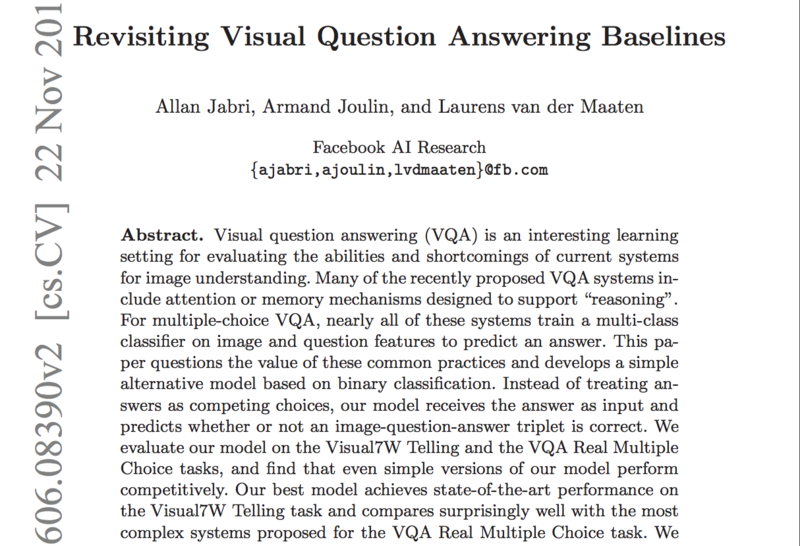 Joint work with M Baroni, A Joulin, T Mikolov, G Kruszewski, A Lazaridou, K Simonic. Laurens van der Maaten and I were frustrated with available visualization tools, so we made visdom at an FB hackathon. We open-sourced it. Hope it is useful for others! 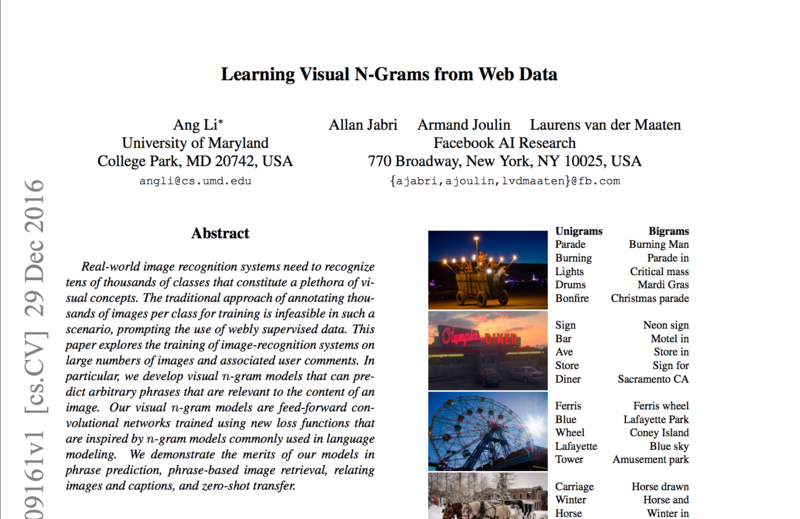 In which we show that one can learn strong visual features without explicit labels.